Last Friday, just two days after doglet #3 arrived, I noticed Celia was a bit wobbly on her legs. Saturday I took her to the after hours vet who suspected a back or neck issue, due to her being a dachshund. I wasn’t convinced, we have had neck and back issues with Alice and this was different. Celia was showing no sign of any pain. But we left with anti-inflams in hand, hoping we would see an improvement quickly. This was not the case, by Monday she was no better, and increasingly walking like she’d been into the gin stash, but in otherwise good spirits. Back to our regular vet who said he wasn’t 100% convinced either about the back/neck issue but without more definite symptoms, and of course she was fine while at the vets, to “wait and see”. Tuesday I took the new dog for her annual shots and a general health check. I hijacked the vet (a different one) and showed her some video I’d taken of Celia during the afternoon with a definite tremor and wobble going on. She said she was pretty sure that it was some sort of “brain issue”. However even with an MRI or other extensive testing, there was little chance of treatment so she said “quality of life”. Yesterday afternoon, I got home early from work, around 2.30pm. Celia was delighted to see me but I noticed she was falling over and walking with a very definite stagger to the right. I ate an apple and broke the core into 3 (removing the pips) but Celia looked at me as if I’d gone nuts. She never turned down food. Not good. So by 3.30pm I was back to the vet. Celia just lay on the table, seeming to be completely without muscle tone. Vet said, next stage was likely seizures but to keep an eye on her, not leave her unattended where she could hurt herself, and make sure she was eating/drinking ok. She said due to the speed of the condition, we likely had days left. Back home we went and then…. we went for a walk, Celia was back to “normal”, instinct kicked in and we had a lovely family stroll around the block – Celia, me, my partner, her much adored Grandma and her sisters. Jimmy, our wonderful house and pet sitter came to say “goodbye” just after 5pm. She was cuddling Celia and took her outside to say a few quiet words of goodbye and love. Celia fidgeted and Jimmy put her on the grass where Celia immediately vomited and had the seizure the vet had spoken of only 2 hours earlier. Back to the vet where we made the decision that this would be her last trip there. Our final act of love to our precious girl. She slipped into that last, deep, permanent sleep while we held her. She was too young to go, only 6 and a half. She had such a rough life before we got her 18 months ago. She deserved to live such a long and happy life. She destroyed our furniture and furnishings, but stole her way into our hearts and family. The pansies she loved to munch on will now flourish, we will no longer hear “Missy Thunder Thighs” stampeding down the hallway for a cuddle. We will no longer have the dancing in the kitchen at dinner time, or the demented chimpanzee like screaming when we go for a walk. We can now return the cushions to the couch where they will remain uneaten, and my slippers will stay where I leave them. But I’d give anything to have her back and have her live out her life with us. When Hugo and then Ruby passed away, it was sad, but they were both old dogs. Celia should have had another 6 years or more years with us! I feel so cheated, it’s so unfair. I loved her with all my heart… but she knew she was loved. We will miss her terribly, especially Alice as they were so bonded to each other. So we needed doglet #3 but not for the reasons we expected. Goodbye my sweet precious, always in my heart. There is no consolation at such times as this; nothing to be said. I don’t know if it helps, but some times, though, I think of the following: “It is easy to forget that in the main we die only seven times more slowly than our dogs.” ― Jim Harrison, The Road Home: https://www.goodreads.com/author/quotes/17055. I always liked the idea that heaven is where all the dogs you ever loved will be there to greet you. I know the pain will fade and we will remember the good times with her and laugh at her crazy antics. But we have to get over the anguish first. So sorry for your loss! It is never easy saying goodbye to a pet. She seemed to be well loved. She was completely and totally loved even with her passion to munch on soft furnishings. She will and is hugely missed. Tears here for your Celia and the companions I’ve lost. They show us the nature of pure, uncomplicated love. Thinking of you as you grieve her loss and celebrate her gifts. Thank you for your lovely words. Sorry to for your passed fur friends. So sad. Poor Celia. I’m very sorry for your loss. I’m sure that this blog was very hard to write. She was very fortunate to have experienced such a loving owner. Thank you. It wasn’t easy to write but helped with getting my emotions out. Oh I am so sorry! My dog died and I was heartbroken. This is the 3rd dog in the last two year for us but the others were old 12 and 15 – so much easier to accept ;-(. Thank you for your kind words and Lucy was lucky she had people who cared so much for her. So sorry. But you had six years of love. That’s pretty amazing. Alas we only had 18 months with her as she was a rescue but we were so lucky to have had that long with her. She was a very sweet and funny girl. Sorry about your loss… Stay strong.. Such a heartbreaking time when we lose our beloved pets. Celia may have had a hard start in life, but you gave her 18 months of the best-ever, including the compassion to accept that she needed to go. I’ll think of her over the Rainbow Bridge, getting to know the many who have gone before her. 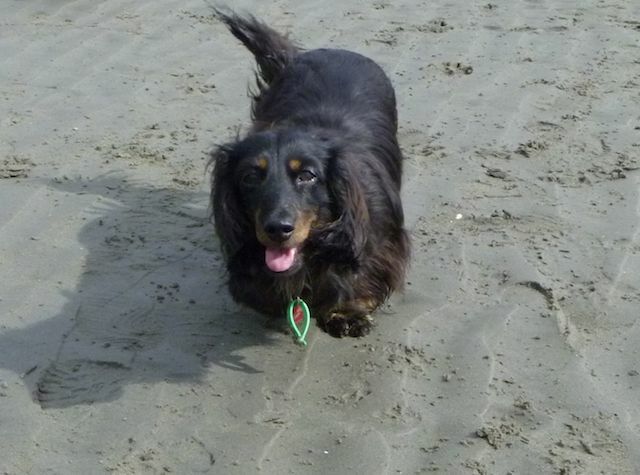 A friend just lost his dachshund, Herbie. I think he and Celia would make a great pair. Thanks for sharing a tribute to Celia at such a painful time. 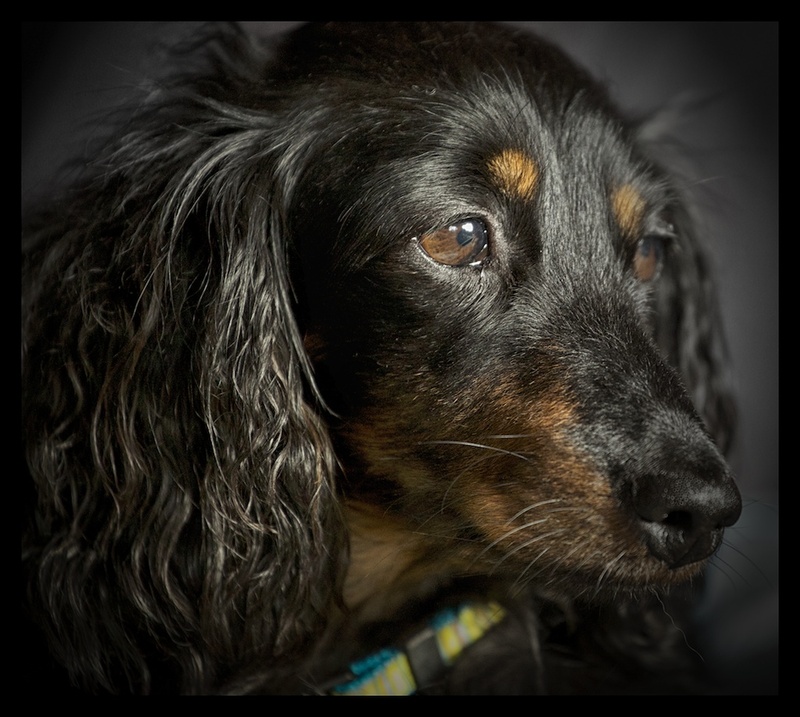 Thanks – we are holding a celebration of Celia’s life today and also for a friend who lost her older dachshund Sadie a couple of weeks back. Sorry to your friend for the loss of Herbie – little dogs with larger than life personalities. I’m crying and feel for you. I am so sorry for your loss. Losing a pet is so very hard. You are a wonderful person for caring for these rescue dogs. Hugs. I am welling up, so sorry! It’s such a devastating thing to have to do – my parents recently put our family dog down after battling cancer. At least your dog is in peace. Sorry for your family loss too – these precious creatures leave a big gap in our hearts when they leave. I’m so sorry about your sweet Celia. Thinking of you. Thank you and I very much enjoyed Oreo and Aero’s story. They bring us comfort and joy but such sadness when they go. You poor thing. You are always talking about you dogs and now you have written a quite deep eulogy. Well done in the circumstances. Thank you – she will be hugely missed. So unfair that in that she finally was thinking she really belonged, and her anxiety issues had mostly been replaced by feeling secure and loved. She was a sweet angel and I can’t believe she’s gone. Life is very unfair sometimes. I just stole Grandpa’s photo of the monolith so you’d better see and then tell me to ask permission next time. Sorry but I had to do it on the spur of the moment. Hi Paula, ive just seen your blog now about Celia. Im so very sorry for you. 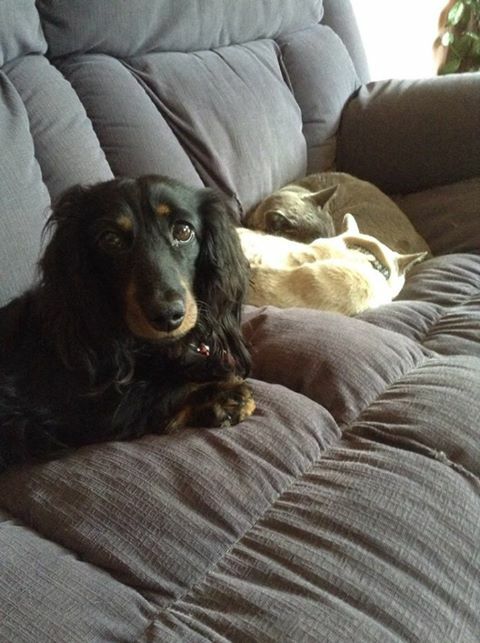 You had your dream of 3 dachshunds for such a short time. Thank you for the lovely photos you posted of Sugar. She looks right at home on your bed. More than ever we are so pleased we chose you as her new mommy. We are completely heartbroken about Celia but more than ever realise that Sugar coming to us was fate. We needed her to fill our hearts and homes with Celia leaving us. We have had a lovely time this weekend with some toys and she’s taken great delight with chasing a giggle ball around the lounge and playing with a squeaky skunk. She’s such a sweet girl and we completely adore her! We are so grateful you picked us to be her new family. Thank you so much! My condolences… Our family always had these four legged chunks of love. My oldest daughter had to put down her most beloved Corgi last Monday; he had cancer of the spine. Her face is still puffed up from the perpetual crying.